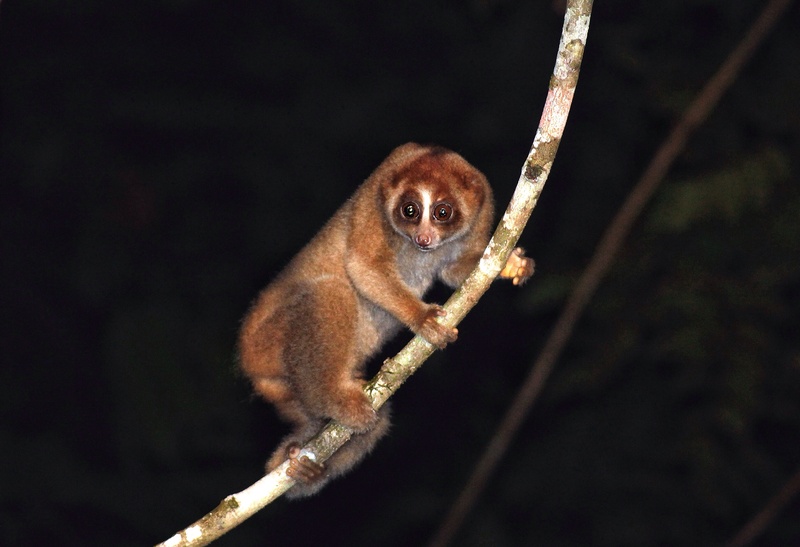 Over the past couple of weeks we have showcased some remarkable animals on iAMsafari and today’s slow loris (Nycticebus menagensis) is definitely another one! With the Western Tarsier being the smallest primate of Borneo, the slow loris is second in line – with only 11 inches in length and a body weight of around 300 grams it’s certainly no giant. Apart from the fact these animals are small they live high in the forest’s canopy and are therefore very hard to spot – combined with extremely low population densities of around one individual per 12 km² one is actually very lucky to find one at all. The first slow loris we encountered near the Sepilok Rainforest Discovery Centre walked on a height of 25-30 metres, slowly but surely moving on a thick branch in search of insects, fruits and tree gum – a fair sighting at dusk from the centre’s canopy walk, and judging the enthusiasm of our guide we got the impression this had to be regarded as very special. But as on so many occasions on this trip luck was on our side. Only one week later, on a night drive in Danum Valley, we got a special treat when the driver suddenly braked while excitingly shouting “slow loris, slow loris”. The two accompanying rangers jumped off the roof of the car and quickly walked to a slow loris climbing a vine right next to the road – at a height one could have easily picked it up. I quickly followed on my thongs into the tall grass, forgetting about mosquito’s, biting bugs or worse, just to get that one shot. Gotcha!!! Thanks Alison – happy you like them! It’s another cute and adorable monkey although they’re capable of delivering a painful toxic bite. How lucky you were to be able to see this incredible animal !!! And then be able to take this gorgeous picture !! I think you should apply to write an article in a nature magazine or something, seriously. That sounds like a noble mission – I’m on it!!! I bet that was a thrill to be able to get those photos! Cute little “nagapie” and great nighttime wildlife photography, Maurice! As always, thank you so much Dries – and yes Nagapies and Lorises are related indeed!